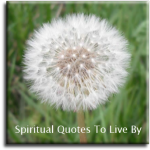 These sayings about parents are all positive inspirational words of wisdom and love on the joys of being a parent. A grandmother is.. a little bit parent, a little bit teacher and a little bit best friend. A son or daughter may outgrow your lap, but they will never outgrow your heart. A tree is known by it's fruit. Anything which parents have not learned from experience, they can now learn from their children. As long as you have the blessing of your parents, it does not matter, even if you live in the mountains. Children internalize much of what they're told about themselves and carry it for a lifetime. Choose words that empower. Don't raise your kids to have more than you had, raise them to be more than you were. I don't want my children to be what I want them to be. I want the to become everything God created them to be. I will hold you tight, support you, guide you, teach you, hug you, protect you and love you with all my heart and Soul.. I am your parent. Since the day you were born and until I draw my last breath, all that I am is yours. I will.. Let them be little. Fill their hearts with laughter. Help them grow wings. Nurture their sense of wonder. Inspire them to believe. And love them like there is no tomorrow. 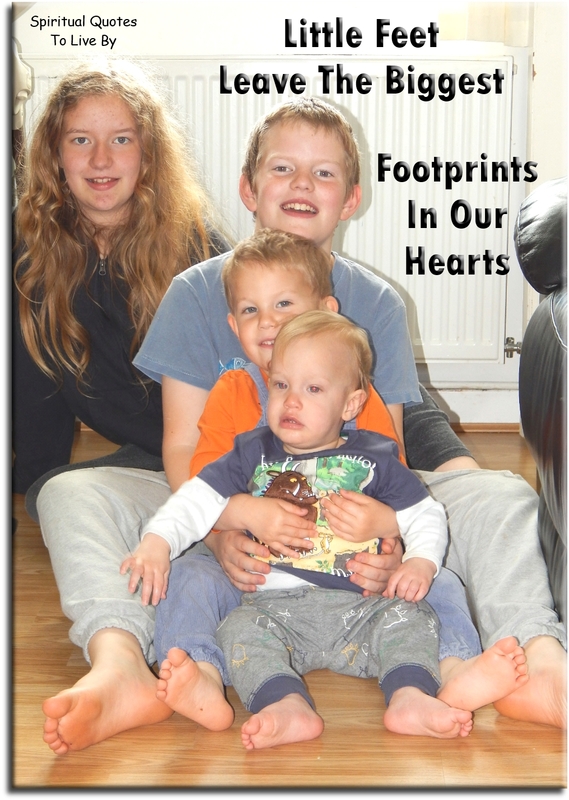 Little feet leave the biggest footprints in our hearts. Love your parents. We are so busy growing up, we often forget that they are also growing old. My child is my rainbow, my ray of light in the darkest storms. 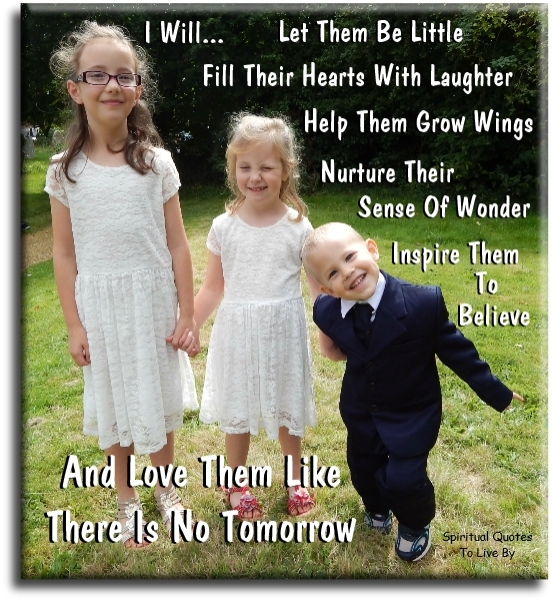 My kids are my heart and Soul. They will always be my babies, even when they grow old. Nothing makes a woman love a man more than seeing how much he loves their children. The child of a tiger - is a tiger. 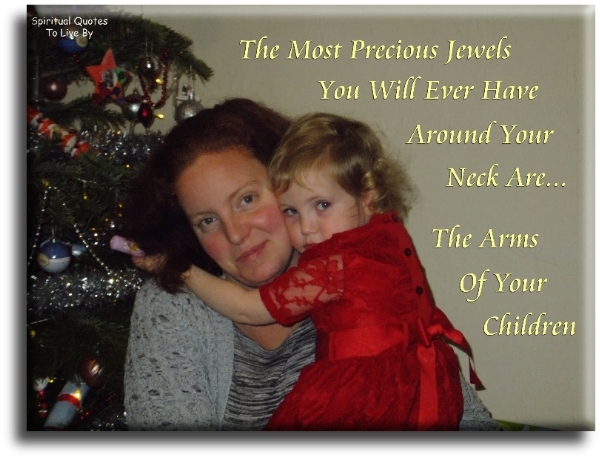 The most precious jewels you'll ever have around your neck are... the arms of your children. There is no way to be a perfect parent... but thousands of ways of being a great one. To be in your children's memories tomorrow... you have to be in their lives today. To understand your parents love, you must raise children yourself. Powdered a little booty, wiped away little tears..
We didn't give you the gift of life.. Life gave us the gift of you. What should not be heard by little ears, should not be said by big mouths. What we are speaks so loudly that our children may not hear what we say. 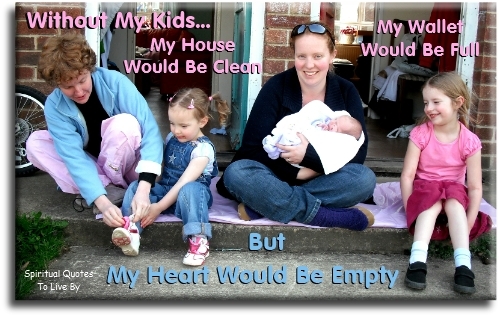 Without my kids.. my house would be clean, my wallet would be full... but, my heart would be empty. Your children will become what you are... So be what you want to be.